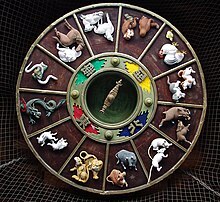 The Chinese zodiac is a mathematical cycle of 12 animals. Each animal represents one year. People are associated with the zodiac animal for the year that they are born. The 12 animals in order are: Rat, Ox & Cow, Tiger, Rabbit, Dragon, Snake, Horse, Goat, Monkey, Rooster & Chicken, Dog, and Pig. Zodiac animals can also represent hours of the day and directions. Although it is called the Chinese zodiac, this system is also used in several other countries in Asia such as Korea, Japan, and Vietnam. Some Chinese people believe that each zodiac animal has a personality, and people born in the same year may have similar personalities. Honest, freedom, hard working, charming. Can be selfish, ruthless, controlling, scheming. Smart, calm, patient, inspiring, modest. Can be stubborn, narrow-minded, demanding, rigid. Aggressive, rebellious, strong, daring, generous. Can be restless, clumsy, hot-temper, impatient. Kind, sensitive, elegant, artistic, cautious. Can be moody, shy, lazy, opportunistic. Strong, proud, direct, eccentric, show off. Can be arrogant, violent, brash, controlling. Wise, graceful, calm, mystic, shrewd. Can be a loner, bad communicator, possessive, distrustful. Cheerful, popular, talkative, witty, earthly, responsible. Can be fickle, rude, gullible, stubborn. Righteous, honest, shy, artistic, understanding. Can be moody, a worrier, a complainer, and soft. Witty, curious, flexible, sociable, smart. Can be vain, clumsy, trickster, snobbish. Neat, organized, alert, scientific, responsible. Can be critical, egotistical, rough, opinionated. Honest, smart, loyal, sense of justice, affectionate. Can be lazy, cold, stubborn, quarrelsome. Simple, hard working, strong, peace-loving, trusting. Can be naive, gullible, materialistic, clingy. 11:00 PM to 1:00 AM is the hour of the Rat. 1:00 AM to 3:00 AM is the hour of the Ox. 3:00 AM to 5:00 AM is the hour of the Tiger. 5:00 AM to 7:00 AM is the hour of the Rabbit. 7:00 AM to 9:00 AM is the hour of the Dragon. 9:00 AM to 11:00 AM is the hour of the Snake. 11:00 AM to 1:00 PM is the hour of the Horse. 1:00 PM to 3:00 PM is the hour of the Goat. 3:00 PM to 5:00 PM is the hour of the Monkey. 5:00 PM to 7:00 PM is the hour of the Rooster. 7:00 PM to 9:00 PM is the hour of the Dog. 9:00 PM to 11:00 PM is the hour of the Pig. The Chinese and Japanese would call the different directions (North, Northeast, Northwest, East, South, Southeast, Southwest, West), based on the names of the zodiac animals. This page was last changed on 10 October 2018, at 06:40.